Mayor Greg Ballard understands public service and doing the right thing. Before becoming mayor of Indianapolis he spent the majority of his career in the U.S. Marine Corps, retiring as a lieutenant colonel after 23 years of service to his country. “The Marines taught me how to focus and to just do the task, don’t get distracted,” he stated. Thanks to the experience, not many problems or challenges erupt in the capital city that he can’t handle. Re-elected in 2011 as the 48th mayor, he’s proud of the many accomplishments of his administration — including the “RebuildIndy,” initiative, the Deep Tunnel Connector Project, bringing Super Bowl XLVI to the city, and “No Hungry Child” and new bicycling initiatives. 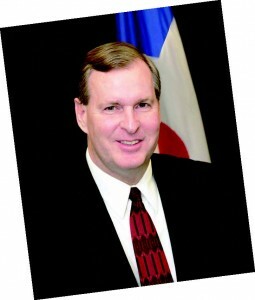 “I’m just trying to do the right thing for the city in the long term,” said Ballard. That’s precisely the thrust of RebuildIndy. The much-needed project is addressing infrastructure problems that have been neglected for decades. In his first term as mayor, he directed $186 million to major repairs and construction of roads, sidewalks, bridges and alleyways, and on tearing down unsafe, abandoned houses. Another $140 million was added to the project in 2012. Notably, no taxpayer money was used for RebuildIndy. A public charitable trust, Citizens Energy, generated the money for these capital projects. The $326 million allocated so far to the effort came out of $425 million in proceeds from the sale of the city’s water and wastewater utilities to the trust. We want to make Indianapolis a very livable city,” the mayor said. “We want everything in a neighborhood that enhances the quality of life.” Because neighborhood development is vital to that goal, he places great emphasis on fixing or tearing down abandoned homes, encouraging new home construction and strengthening financial amenities to communities. He also noted the importance for all neighborhoods to support their local retail stores, school systems and community organizations. Neighborhoods are receiving additional attention through the Deep Rock Tunnel Connector project and “No Hungry Child” initiatives. The Deep Rock Tunnel Connector construction project is being engineered to keep billions of gallons of raw sewage out of the city’s rivers and streams. The combined sewer overflow system will mitigate flooding problems that have plagued various parts of the city for years and improve management of the flows between the city’s two treatment plants. During his first term the mayor’s office also collaborated with state and county services, nonprofits and the private sector to create the Indy Hunger Network — a coalition whose mission is to end childhood hunger in Indianapolis by 2015 by providing an abundance of healthy food, when and where it is needed. By connecting resources, people, places, dollar and ideas, he said during his 2012 state of the state address, he hopes the city has become a place of “caring and compassionate doers,” where everyone has the opportunity to succeed.” At the present time, there are 235 sites where children under the age of 18 can get a free meal. Bringing the NFL’s Super Bowl to Indianapolis in January was an unprecedented coup for the city. It was such a success that the NFL just declared future Super Bowl host cities must basically copy the Indianapolis playbook and include a centralized Super Bowl village and a key attraction like the Capitol Street zip line. Visitors were impressed with the city’s efficiency and hospitality and revenue was brought in to many businesses in the city, including the hotel and food industries. 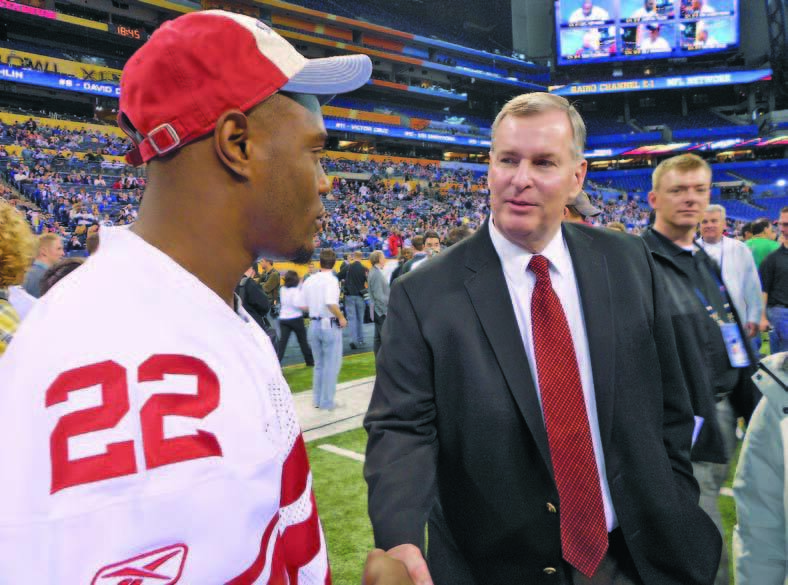 Mayor Ballard chats with New York Giants Defensive Back Derrick Martin during Super Bowl XLVI Media Day in January. Indianapolis set the bar high for future Super Bowl host cities. A culture of connectivity and livability is also evident in the city’s bicycling initiative, which Ballard feels is paramount to living in a large metropolis. He especially wants young men and women who want to live, work and raise families in the city to be excited about this project, which will give them and all residents an alternative transportation mode for navigating the city’s thoroughfares. Before Ballard became mayor, only one mile of city property was designated for bicycle use. As of 2012 there are 64 miles of bike lanes and trails and by the end of 2015 the goal is to have 200 miles of trails and bicycling lanes in the city that will connect to each other. A native Hoosier, Ballard knows his city well. He was raised on the east side of Indianapolis and, after high school, earned his undergraduate degree in economics from Indiana University. Rising through the ranks of the Marine Corp. and holding a variety of leadership and staff positions in logistics, transportation and acquisition, both at war and peace, he is a veteran of the Persian Gulf War and a service-disabled veteran. Ballard received numerous medals for his military service, including the Legion of Merit, the Meritorious Service medal and the Marine Corps Expeditionary medal. Prior to his first term as mayor in 2008 he was a self-employed leadership and management consultant. He authored a book, “Ballard Rules: Small Unit Leadership,” and conducted seminars and modular training based on it. He also taught college-level economics, marketing and management courses at Indiana Business College. Active in the community, he has served as a tutor and a member of the advisory board for the Lilly Boys and Girls Club; a contributing editor to both the Indiana Minority Business Magazine and the Indiana Parenting Magazine; and a founder of the Indianapolis Writers Group. Public service, community involvement and belief in a strong and vibrant city are commitments he holds steadfastly. “We have started to build our house. We have built a strong foundation with economic stability and fiscal prudence, continued job commitments, construction projects and growth, connecting our neighborhoods like vines,” Ballard said in his State of the City speech in April. Undaunted by challenges, he looks forward everyday to working on solutions that will benefit his city and its residents, one house, one block and one neighborhood at a time. The mayor and Indianapolis Department of Public Works Construction Administrator Mike Smith examine the progress on the city’s $12.8 million RebuildIndy investment along Georgia Street in September. Georgia Street was transformed from a four-lane street with curbs, gutters and parking along the sidewalks to a two-lane curbless street. Wide pedestrian facilities were constructed in front of buildings, with a pedestrian mall located in the median. Other improvements included bicycle racks, historical signage, lighting and alternative drainage systems.